Context or provenance details who created the records i.e. company name and/or division and/or department and/or section and/or project and/or person; depending on the complexity of your organisation and how much you know about the record. Content detail – what information is in the records, what does the record tell us, and when was it created i.e. date or date range. The level of detail here can be high level or fairly in-depth depending how interesting it is in terms of what it describes and how you will re-use the information. For example you may want to list at item level all of your companys press releases including their titles so that a computer search for any publicly-communicated event is easily found. On the other hand a decades worth of risk registers can be described as risk registers with covering dates e.g. 1995-2005. 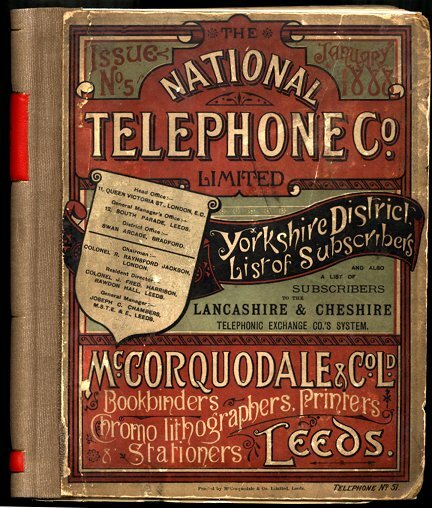 National Telephone Company phone directory for Yorkshire. Image courtesy of BT Heritage.